Banbury is a market town in on the edge of the northern Oxfordshire Cotswolds. The written history of this 'nursery rhyme' goes back to 1784 but it was not written for children and like many other so called nursery rhymes this rhyme may well carry its own delightfully history. The catchy little rhyme has made Banbury famous throughout the English speaking world and Banbury Cross a tourist attraction. But the Cross that stands in the centre of Banbury has nothing to do with the rhyme. The cross now standing was erected in 1859 to commemorate the marriage of Queen Victoria's eldest daughter. "God be thanked, their god Dagon is fallen to the ground." This rather intriguing statement raises more questions than can be answered here but could this be a hint that Banbury Cross might have had a pagan ancestry? Local tradition suggests that the fine lady was a member of the Fiennes family, the local aristocratic ancestors of Lord Saye and Sele who own nearby Broughton Castle. The rhyme has been associated with Celia Fiennes who apparently rode side saddle through every county in England and later published a journal about her journeys. It is possible that Banbury Cross refers not so much to a monument as to the location of crossroads. Banbury was built at the junction of two ancient roads the Salt Way, still used as a bridle path and Banbury Lane, part of the Jurassic Way which ran from the Humber to the Avon. 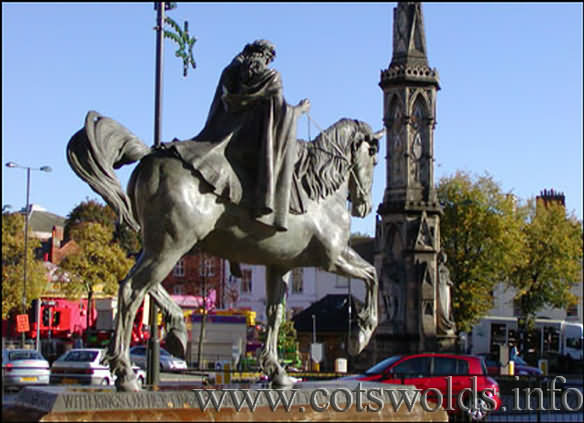 Another connection is with the Welsh horse goddess Rhiannon who features in the Mabigion. It has frequently been suggested that the rhyme is a reference to one of the horse goddesses and one article mentions Rhiannon with morris dancing and suggests that she is indeed the 'fair lady'. The real story behind the nursery rhyme is lost in history but it is conceivable that there is a hint of paganism in it somewhere and possibly it is combined with a bit of irreverence to certain high born ladies. For further detailed information read the article - 'A Possible Solution to the Banbury Cross Mystery' by Roberta Allen.